A verb is a word or group of words that describes an action, experience, or state, such as 'come', 'see', 'jump' and 'put on'. There are estimated to be more than 20,000 verbs in the English language. Here is a list of the top 25 verbs from the Oxford English Dictionary. 1 Be [past tense: was, were, past participle: been, present participle: being, first person singular: am, second person singular and plural: are. third person singular: is. 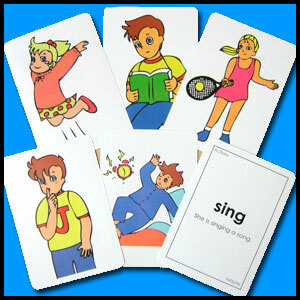 ]Used with a present participle to form the continuous tenses of verbs. We will be starting in one hour. Gemma was reading. That man is always causing trouble. 2 Have Used to say what someone or something looks like, what qualities or features they possess. He didn't have any manners. The food does not have any flavour. 3 Do To perform an action or activity. You need to do more exercise. 4 Say To express an idea, feeling, thought etc. using words. Did she say what happened at the meeting? 5 Get To receive something that someone gives you or sends you or to obtain something by finding it, asking for it, or paying for it. What did you get for Christmas? We need to go and get help. 6 Make To produce or create something. I am going to show you how to make a box for your tools. 7 Go To travel or move to a place that is away from where you are. I want to go to the shops. 8 Know To have information about something. Do you know what time it is? I don't know where to go. 9 Take To remove something from a place. Take your feet off the seat. Did you take my pen? 10 See To notice or examine someone or something, using your eyes. Can you see the aeroplane in the sky? 11 Come To move towards you or arrive at the place where you are. Can you come here for a minute? 12 Think To have a particular opinion or to believe that something is true. I think I left my keys at John's house. 13 Look To turn your eyes towards something, so that you can see it. If you look careful you can see a rabbit in the hole. 14 Want To have a desire for something. I want a piece of cake. 15 Give To let someone have something, or to provide something for someone. What did Bob give you for your birthday? 16 Use If you use a particular tool, method, service or ability, you do something with it for a particular purpose. Can I use your phone? I always use the same shampoo. 17 Find To discover, see, or get something that you have been searching for. Did you find your keys? 18 Tell If someone tells you something, they communicate information, a story, their feelings etc to you. I'll tell you all about the accident when I get back. 19 Ask To speak or write to someone in order to get an answer, information, or a solution. I will have to ask someone how to get to the station. 20 Work To do a job, activity or duty. I have a lot of work to do in the garden. I work at the University. 21 Seem To appear to exist or be true, or to have a particular quality. Anne didn't seem to know the answer. Doesn't that seem strange to you? 22 Feel To experience a particular physical feeling or emotion. I feel a bit better today. Do you still feel hungry? 23 Try To attempt to do or get something. I am going to try to reach that box on top of the cupboard. 24 Leave To go away from a place or a person. My baby gets upset when I leave the room. 25 Call To telephone someone. I will call him tomorrow; To use a word to describe someone or something in a particular way. Are you calling me a liar? This entry was posted on Monday, January 17th, 2011 at 11:34 am and is filed under Useful Vocabulary. You can follow any responses to this entry through the RSS 2.0 feed. You can leave a response, or trackback from your own site.